LightLife Tofu Pups These babies are about as boring as regular hot dogs. They’re lower in sodium than their traditional counterparts but otherwise have a disturbingly similar taste and texture. These are highly processed but make a welcome addition to mac and ‘cheese’ or pizza after being sauteed and seasoned. Each package will cost you about $5 so that’s less than a dollar a sausage. They’re worth giving a try but nothing special. Elani Sausage Roll comes in 4 flavors: Fine Herbs, Mediterranean, Mushroom, and Tomato. We tried all 4 flavors and tomato is the only flavor that’s particularly interesting; the rest are just okay. This product has a distinct peanut flavor and that’s because they’re made with peanuts. If you have an allergy to this particular legume, steer clear. 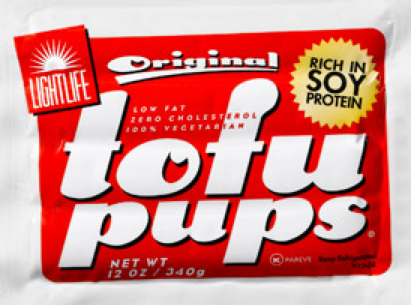 It’s not quite as good for you as the tofu pups but it’s a better flavor option. The texture is pretty homogenous but it’s ingredients are fairly innocuous (despite being fairly processed) mostly peanuts and seasonings. Sauteed with spices, it’s awesome. This oversized sausage roll will run you $6.50 or so and is worth the investment. This sausage is great with a tofu scramble, on pizza or in a wrap. If there’s a vegan sausage that’s gluten-free that you’d like to see reviewed here, I would really love to know about it. Until next time, the best gluten-free vegan sausages you’ll find are the ones you make at home as far as I know.